In order for the salt cod to be totally desalinised, it requires to be soaked in a bowl of cold water for 2 to 3 days – changing the water every day. Drain the water and pat dry the cod using a clean tea-towel and carefully remove the skin by peeling it off. Cut into pieces of desired length. Cut cherry tomatoes into quarters and place in a bowl. Chop onion and celery stick finely, and place in a saucepan or deep fry pan with 4 tblsp of olive oil. Sweat the onion on low heat until translucent and then add the tomatoes and season to taste. Allow the tomatoes to cook down and add 1/2 cup of white wine and place lid on saucepan to simmer. Meanwhile peel potatoes and cut into 1cm thick rounds. 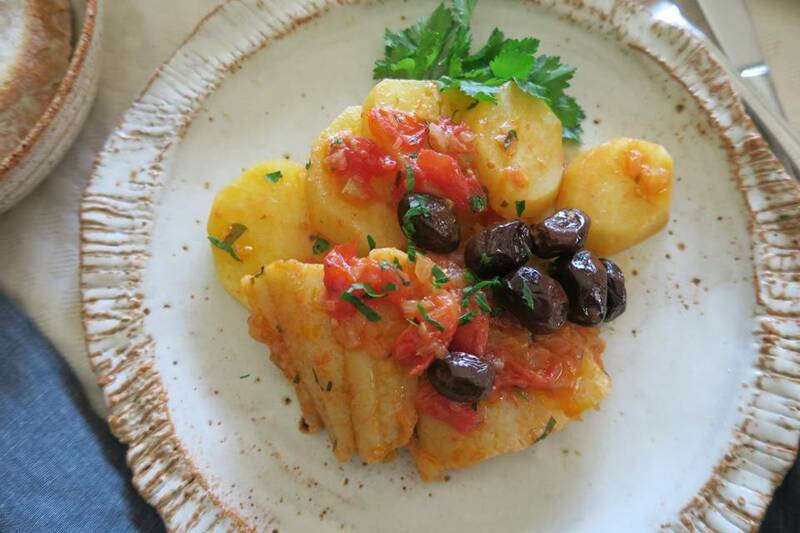 Once the tomatoes have started to break down, add the potatoes and cod fish and stir through the sauce. If the sauce has dried out too much, add 1/2 cup of water and stir through. Place the lid on saucepan and allow to simmer on low heat until the potatoes have cooked through. The cod fish will be cooked once the potatoes are tender. Add the olives and cook for a further 5 minutes with lid on to heat through and give flavour to the dish. This dish is served as a main with crusty bread and garnished with chopped parsley. Enjoy!